"You won't have to go to Texas to get the big BBQ taste. You'll be the envy at your backyard BBQ party. You like it spicy or sweet it's up to you. Put it on chicken, beef and/or ribs. You won't be disappointed. Enjoy!" Place the apple cider vinegar in a medium saucepan, and bring to a boil. 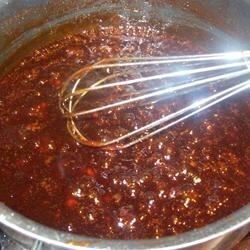 Mix in the ketchup, onion, garlic, dry mustard, chili powder, seasoning salt, and cayenne pepper. Stir in the brown sugar. Cook, stirring often, 10 to 15 minutes. Reduce heat, and, stirring occasionally, allow the mixture to simmer about 45 minutes, until thickened. Cool before serving. The secret’s out! Here’s the recipe for our classic barbeque sauce—revealed! Just enough sweet with a little zip. Excellent for pulled pork bbq sandwiches. This was very good. Used it for pulled pork and BBQ spare ribs....I couldn't get it to thicken up as much as I wanted it so it didn't get five stars.